U.S. hospitals and health care workers receive emergency response training for a variety of scenarios -- from natural disasters to terrorism to handing an influx of patients with infectious diseases such as Ebola. But as details have unfolded about the first patient to be diagnosed in the U.S. with the deadly virus, many say the staff at Texas Health Presbyterian Hospital Dallas were unprepared to handle the patient -- and that this is likely the case at hospitals throughout the country. Bonnie Castillo, director of the Registered Nurses Response Network, part of the nurses union National Nurses United, said a majority of union members surveyed say their employers haven't offered appropriate training to deal with an Ebola outbreak. "It's not a matter of posting something or reading something online," Castillo told CBS News. 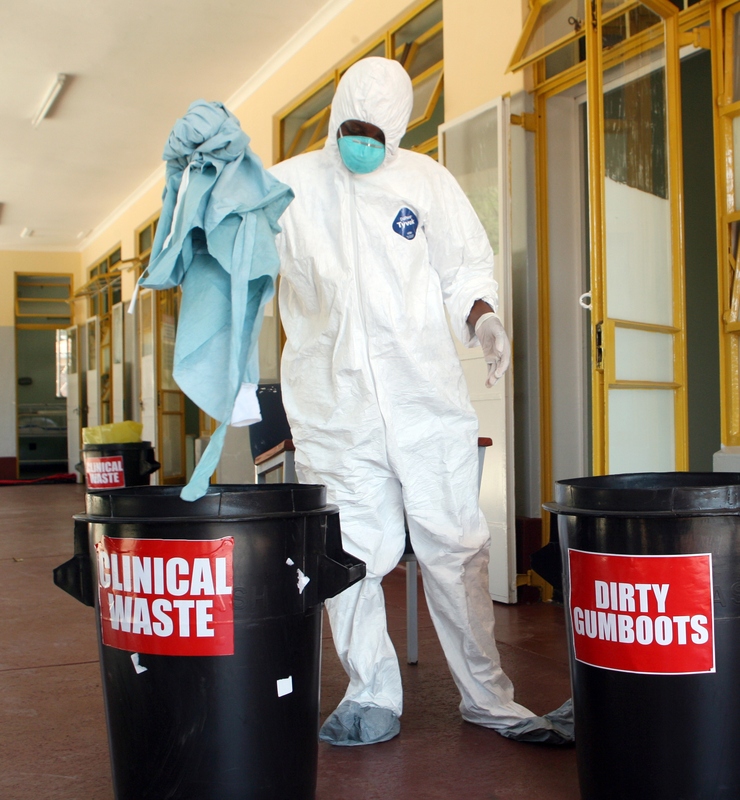 "It's important to have interactive training, and also that there's demonstrations of donning and doffing [protective gear], especially when removing the suits and equipment; that's where there's a great chance for contamination and infection." Last week, NNU surveyed 400 registered nurses in their association and found 60 percent don't feel they've been trained to handle patients with the Ebola virus; 80 percent say the hospital has not communicated a policy about potential admissions of infected patients; and 85 percent said they were not provided any type of formal education to prepare for Ebola patients. When the first U.S. Ebola patient, Thomas Eric Duncan, initially visited a Dalls hospital on Friday, a nurse, using a checklist, asked whether he had traveled from Africa -- one of the questions designed to help spot the possibility of Ebola infection. Duncan said he'd recently come from Liberia, but this information was not relayed to the rest of the medical staff, apparently because of a technical glitch in the electronic medical records system, the hospital said. Duncan was sent home with a prescription for antibiotics, a move that delayed his treatment and potentially exposed at least a dozen people, including five children, to the virus. At a CDC press conference held Tuesday, Dr. Edward Goodman, the hospital's epidemiologist, said the institution has a "robust infection control program" and that the hospital has for some time been prepared to identify and treat Ebola patients. However, it appears that the reality fell short. Castillo said more must be done on a federal level to ensure hospitals are properly training their staff. "Because we have a privatized health care system it's all over the board," said Castillo. "There's no uniformity or enforcement mechanism." The CDC's eduction materials for hospitals include instructional videos, a checklist for a health care workers to use when evaluating a patient and an infographic on how to properly put on and remove protective gear. Dr. Brian Koll is executive director of infection prevention at Mount Sinai Health System in New York City, which had an Ebola scare in August. A patient with flu-like symptoms was suspected of having the disease but the test later came back negative. Koll helps to develop training materials and workshops to prepare hospital staff for a range of scenarios. He said the hospital ramped up their emergency readiness training after 9/11, in response to fears of a smallpox or anthrax attack. To create Mount Sinai's education program, Koll says he draws on materials from a number of sources, including the CDC, New York State Department of Health, New York City Department of Health and Mental Hygiene and the World Health Organization. "There will be written materials, PowerPoint, something on the computer, and then it's real life," he said. "We do a variety of drills with a variety of scenarios." Such drills include practicing the proper way to put on and take off protective gear, such as gloves, fluid-resistant gowns and goggles, as well how to draw blood safely and dispose of biohazardous materials. Actors play patients in various emergency scenarios, which helps clarify proper protocols. Koll stressed that much of what they cover in the workshops is common sense -- basic safety practices that must be enforced whether a patient has Ebola or the common cold. Koll thinks it's best to leave it an individual medical institution to develop a training program that is most beneficial to their staff because every hospital has different systems in place that impact workflow and a patient care. He believes state health departments must be held more accountable since they serve as liaisons with the CDC. A spokesperson from the health care arm of Service Employees International Union (SEIU), which represents approximately 1 million health care workers in the U.S., told CBS News that CDC Director Dr. Thomas Frieden held a meeting to brief members of the Partnership for Quality Care on Wednesday evening. PQC is a coalition of nation's leading hospitals and health care workers, including elected members of SEIU Healthcare. The group has agreed to assist CDC's efforts on Ebola, though the plan is still in development and could not be made public at this time.